In Unit 13 of The Physics Classroom Tutorial, it was emphasized that we are able to see because light from an object can travel to our eyes. Every object that can be seen is seen only because light from that object travels to our eyes. As you look at Mary in class, you are able to see Mary because she is illuminated with light and that light reflects off of her and travels to your eye. In the process of viewing Mary, you are directing your sight along a line in the direction of Mary. If you wish to view the top of Mary's head, then you direct your sight along a line towards the top of her head. If you wish to view Mary's feet, then you direct your sight along a line towards Mary's feet. And if you wish to view the image of Mary in a mirror, then you must direct your sight along a line towards the location of Mary's image. This directing of our sight in a specific direction is sometimes referred to as the line of sight. As light travels through a given medium, it travels in a straight line. However, when light passes from one medium into a second medium, the light path bends. Refraction takes place. The refraction occurs only at the boundary. Once the light has crossed the boundary between the two media, it continues to travel in a straight line. Only now, the direction of that line is different than it was in the former medium. If when sighting at an object, light from that object changes media on the way to your eye, a visual distortion is likely to occur. This visual distortion is witnessed if you look at a pencil submerged in a glass half-filled with water. As you sight through the side of the glass at the portion of the pencil located above the water's surface, light travels directly from the pencil to your eye. Since this light does not change medium, it will not refract. (Actually, there is a change of medium from air to glass and back into air. Because the glass is so thin and because the light starts and finished in air, the refraction into and out of the glass causes little deviation in the light's original direction.) As you sight at the portion of the pencil that was submerged in the water, light travels from water to air (or from water to glass to air). This light ray changes medium and subsequently undergoes refraction. As a result, the image of the pencil appears to be broken. Furthermore, the portion of the pencil that is submerged in water appears to be wider than the portion of the pencil that is not submerged. These visual distortions are explained by the refraction of light. In this case, the light rays that undergo a deviation from their original path are those that travel from the submerged portion of the pencil, through the water, across the boundary, into the air, and ultimately to the eye. At the boundary, this ray refracts. The eye-brain interaction cannot account for the refraction of light. As was emphasized in Unit 13, the brain judges the image location to be the location where light rays appear to originate from. This image location is the location where either reflected or refracted rays intersect. The eye and brain assume that light travels in a straight line and then extends all incoming rays of light backwards until they intersect. Light rays from the submerged portion of the pencil will intersect in a different location than light rays from the portion of the pencil that extends above the surface of the water. For this reason, the submerged portion of the pencil appears to be in a different location than the portion of the pencil that extends above the water. The diagram at the right shows a God's-eye view of the light path from the submerged portion of the pencil to each of your two eyes. Only the left and right extremities (edges) of the pencil are considered. The blue lines depict the path of light to your right eye and the red lines depict the path of light to your left eye. Observe that the light path has bent at the boundary. Dashed lines represent the extensions of the lines of sight backwards into the water. Observe that these extension lines intersect at a given point; the point represents the image of the left and the right edge of the pencil. Finally, observe that the image of the pencil is wider than the actual pencil. A ray model of light that considers the refraction of light at boundaries adequately explains the broken pencil observations. 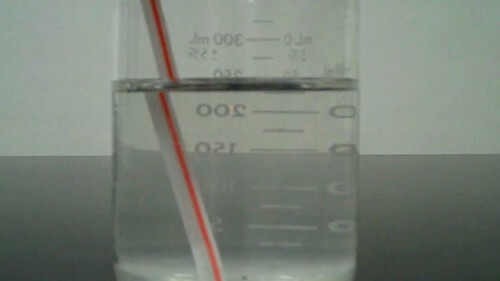 A straw is placed with a diagonal orientation within a half-filled beaker of water. At the surface of the water, the straw appears to be misaligned or broken; the portion of the straw above the water is shifted relative to the image viewed under the water. The bending of the path of light as it passes from the water to air causes the observed distortion of the image of the straw. The broken pencil phenomenon occurs during your everyday spearfishing outing. Fortunately for the fish, light refracts as it travels from the fish in the water to the eyes of the hunter. The refraction occurs at the water-air boundary. Due to this bending of the path of light, a fish appears to be at a location where it isn't. A visual distortion occurs. Subsequently, the hunter launches the spear at the location where the fish is thought to be and misses the fish. Of course, the fish are never concerned about such hunters; they know that light refracts at the boundary and that the location where the hunter is sighting is not the same location as the actual fish. How did the fish get so smart and learn all this? They live in schools. Now any fish that has done his/her physics homework knows that the amount of refraction that occurs is dependent upon the angle at which the light approaches the boundary. We will investigate this aspect of refraction in great detail in Lesson 2. For now, it is sufficient to say that as the hunter with the spear sights more perpendicular to the water, the amount of refraction decreases. The most successful hunters are those who sight perpendicular to the water. And the smartest fish are those who head for the deep when they spot hunters who sight in this direction. Since refraction of light occurs when it crosses the boundary, visual distortions often occur. These distortions occur when light changes medium as it travels from the object to our eyes. That frosty mug full of A&W root beer seems to drain so quickly. What seems like a lot of root beer is actually a lot of glass. 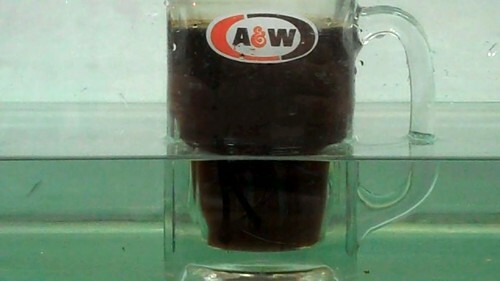 The deception is uncovered when the root beer mug is submerged in water. When looking at the mug above the water level, there appears to be a lot of root beer. But when looking at the mug below the water level, one observes the truth; the water surrounding the glass minimizes the effect of refraction and reveals the large quantity of glass. We've been deceived!